UW’s current Human Resources system, HRMS, will be replaced by WyoCloud Human Capital Management (HCM) on January 22, 2019. Our new WyoCloud system will change how you view your paycheck, access your W-2, update your personal information, complete performance evaluations, and much more! Additional information on how WyoCloud HCM will impact employees will be added to this page as available. WHAT DO I NEED TO KNOW ABOUT WYOCLOUD HCM? All employees will have access to WyoCloud Human Capital Management Employee Self-Service. Some employees, including Managers, will receive additional access based on their job duties. 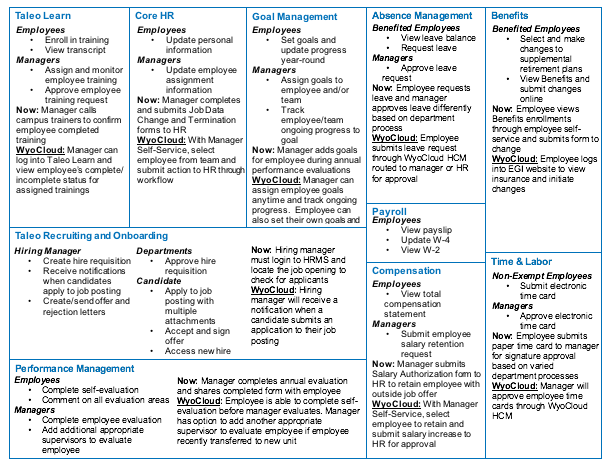 Below is an overview of each module that is to be included in WyoCloud HCM. More detailed information will be posted as it is available. WHY ARE WE MOVING TO WYOCLOUD HCM?